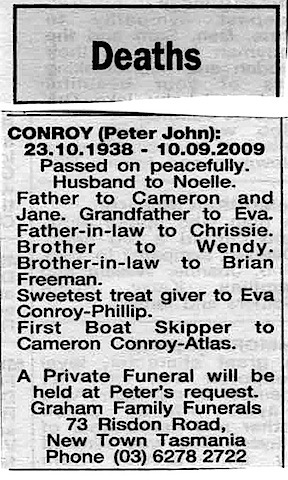 Bill Bowen reports that the Saturday West Australian Obituaries announced… “Peter John Conroy” died on Thursday 10th September 2009. Peter was Bill’s predecessor as STW Station Manager; he was Station Manager and General Sales Manager, before Laurie Kiernan asked him to concentrate on Sales. June Holmes notes that staff who worked at STW9 in the late 1960s will be sad to learn that PETER CONROY passed away on Thursday. Peter was Station Manager and Sales Manager in those days and worked with Milton Francis (also recently deceased). Peter will be buried in Tasmania – which is where he and Noelle have lived for the past few years. 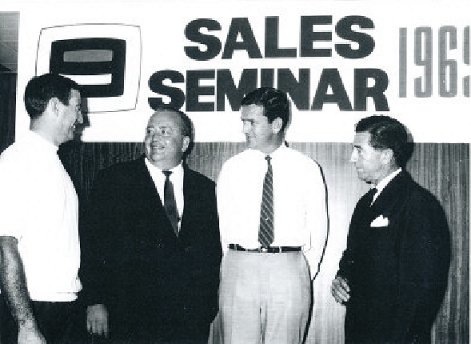 “I have attached the only old photo (I have) which includes Peter Conroy (on the right) with Bob Mercer (who was STWs first General Manager) at a Sales Seminar in 1969. (Marie Breckinridge was taking notes of the meeting). Peter was Sales Manager 1964-68 and then Station Manager 1968-69. His wife’s name is Noelle and they have been living in Tasmania since 2003. Kevin Campbell reports that Peter died at 6.45 pm on Thursday evening. “From speaking with both his daughter Jane and Noelle, he was not in any pain leading-up to the time. Sad that another departs us. He of course took that big kick in life when his top gun son Cameron, who was flying an FA18 disappeared some years ago never to be found although some bits of the fuselage were found in the Gulf of Carpentaria. Darcy Farrell reports that he is, “Very sorry to hear it. I don’t think Peter ever overcame the death of his son, a Top Gun pilot in the RAAF who died when he drifted into unconsciousness in an F18 or something similar over the Gulf of Carpentaria about ten years (or more) ago. With Brian Treasure, Peter played a very important role in acquiring the first Test Cricket match ever to be played at the WACA. The duo produced the submission that went to what was then the Board of Control. It was a successful pitch which placed Perth permanently on the Test Cricket program. Peter was also on the boards of numerous charities including WA Week (now Celebrate WA) in its infancy. I think he remained a strong WACA committee man and I’m pretty sure he was on the committee at Lake Karrinyup Country Club. Spot on Darc and thanks for supplying the refresher. I had forgotten about his involvement with the cricket “pitch”. He was also very much at the forefront with the introduction of our WAIS. Apart from that he played cards with Treas a lot and “two bobs against the wall” didn’t he. I’m pretty sure that Greg Byrne was also a very close mate. Anyway, yep, he was a great guy. I gave the speech at Lake Karrinyup when he was locating to Tassie and he asked me to bring into my words, mention of son, Top Gun Cameron. I had a tear and a lump in my throat, as did the majority of the 500 people at his “Roast” lead by the late Wally Forman. PS, fortunately for Pete, the RAAF had set-up a memorial recognition for Cameron, something of course his now late father PJC was very proud. “I saw this too and guessed it was Peter? It made me sad and sorry. Thank you for confirming. I liked him very much and worked with him in Traffic and at STW as an early Floor Manager. Any messages/condolences may be sent to enquiries@grahamfamilyfunerals.com.au and these will be passed onto Noelle and Family. The news of the passing of Peter Conroy reminds me of the joy of the day when Noelle brought their baby boy to Channel 9. A very sad day was when the friends and associates of the Conroys gathered to commemorate the loss of that son Cameron, an outstanding Pilot Officer in the Royal Australian Air Force. Peter Conroy was ever smiling, optimistic, enthusiastic and able to apply himself totally to whatever the project in hand. I always enjoyed the company of that truly ‘gentlemanly’ individual. I usually accept death as being the inevitable lot of everybody, but on this occasion I really wish that such a good man had been spared longer to enjoy with Noelle,his retirement in Tasmania. 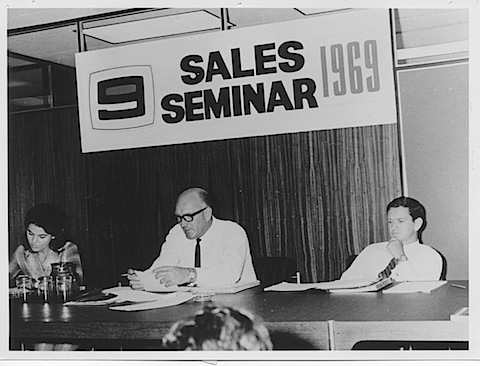 I first met Peter in the mid sixties when he was Sales Manager at 6KY. From the very beginning, I liked his style and we had an instant rapport. We lured him away from STW9 in late 1968 and he was a Director of Parkes Clemenger until he reinvented himself in 1982. Peter had many great qualities, but chief amongst them were his loyalty and his honesty. We shared many successes – and a few setbacks – and the operative word is ‘shared’. When Peter set up his sports marketing consultancy in an office in West Perth, he and I continued our relationship with long talks over many cups of coffee. We remained friends right to the end. We met in person for the last time when he was in Perth this time last year and it was sad to see the evidence of his decline. But, Peter being Peter, in all our succeeding telephone conversations, remained stoical. He was a very special person – a great business partner and a great friend. Peter Conroy was Station Manager and General Sales Manager when I joined STW9 as an accounts clerk in August 1967. Every month I had to face Peter to get him to approve Credit Notes for Advertisers because the Station had charged them incorrectly or the Advertiser claimed we had erred. This could be an intimidating experience. However, Peter was scrupulously fair, listened to my ramblings with great patience and approved my recommendations where appropriate.In a very short time I got to like him a lot as well as appreciating his immense intelligence and great ability. From – mostly unreliable – memory Peter left around the time of the venture into the live Tonight shows in 1968. I always felt that Peter Conroy was a great loss to STW when he joined Parkes Clemenger Advertising Agency. A number of years after Peter left I produced a fairly comprehensive rate-card for the sale of airtime on the Station. There were a couple of hundred calculations involved (in the days before PCs. )Despite double checking I had made one small mistake – Peter Conroy found it! Peter Conroy led a Sales Team at Channel 9 that included some very talented people: John Lord-Football, John Foote-Drama,Frank Oliver-Cricket, Ron Guyot-WW2 Hero and Milton Francis-Olympic Rower.I worked with Milton during all of my tenure at STW.It was always an enjoyable and often highly humorous experience. Milton – like Ron Guyot in Sydney -earned the confidence and, often, friendship of the relevant Ad Agency people in Melbourne. Even when STW ratings were not so good, Milton managed to generate more than his fair share of ad revenue. This success was due, in no small part, to a gregarious personality that was very,very infectious. To hear of the passing of these two great men around the same time is particularly poignant. Milton Francis was my grandfather and it makes me so happy to hear that he was a respected and loved member of the olympic and channel 9 community.